Alternative Heat Survival Concepts, by Philip T.
It’s the dead of winter. Snow is flying. There is nothing more comfortable in the cold of a winter season than knowing you are cozy in your home. You are warm and oblivious to the penetrating cold of the outdoors. But just how vulnerable are you to a sudden and unexpected power outage from an ice storm or another failure of the electrical grid? Do you depend on oil, natural gas, propane gas or electricity for your home heating? Under any circumstance, could your home heating system become unworkable? This article should help prepare you enough so you and your family won’t freeze to death if the grid goes down. I have spent 37 years of my life working as a chimney sweep and/or a brick mason. So my first love of heating alternatives are solid fuel heaters. When I say solid fuel, I am specifically talking about wood, coal, or other biomass, which can be combusted in a controlled environment in exchange for the heating value--as measured in British Thermal Units (BTUs)--of the fuel source. Wood fuel will average up to 8,500 BTU of heat per pound. Coal is approximately 12,000 BTU per pound. Variations of the actual BTU of heat potential will be specific to the density of the solid fuel being combusted and moisture content. Lighter density woods like pine and cedar will take a larger amount of wood to make the heat potential that a smaller amount of oak or hickory will produce. Of course one is limited to whatever is locally available. If you have a good source of coal locally available, that could be your fuel of choice. However, it is unfeasible to import coal or wood from other regions of the country because of the transportation costs and energy expense of the transport. For this reason I do not recommend pellet fuel as a viable survival fuel. I will talk about pellet stoves specifically a little later. There are three types of solid fuel appliances. Fireplaces, free standing stoves, and central furnaces. Each has unique properties, advantages, and disadvantages. Out of the three categories, a fireplace is the most inefficient. A fireplace will achieve perhaps a 10% efficiency rating because most of the heat goes up the chimney. Dampers must remain partially open during all phases of the heating cycle. Glass doors help efficiency considerably over an open fireplace. A better fireplace will have ducting around the outside of the firebox to allow more heat exchange. Masonry fireplaces store more ambient heat than metal box fireplaces. But a metal box fireplace will put out more radiant heat in a shorter period of time. And a masonry fireplace is relatively difficult to add to an existing structure without major modifications in footings and other structural considerations. The installation of a wood burning stove in an existing fireplace, called an Insert will increase the efficiency of a fireplace upwards to a comparable free standing wood stove. But before installing an insert stove in any fireplace, be sure to check manufacturers instructions for both fireplace and the stove insert for compatibility! Failure to follow the instructions or the use of mismatched parts can lead to unsafe and potentially deadly consequences! Safety cannot be stressed enough when using solid fuel heaters. When properly installed and maintained, solid fuel heat is safe, efficient, and economical under any conditions. If you choose to have a gas fireplace, or gas log, be aware that the convenience comes with an expense. If the fireplace has an electric igniter and the power is off, that appliance will not function. Without blower circulation heat build up can become excessive and unsafe. Gas logs can be added, but they are relatively inefficient and ever an increasing expense to operate. Also keep in mind that if there is a disruption in gas supplies and distribution, your gas appliance may become useless within a very short period of time. Propane gas appliances allow storage on site, which may buy you some time. But under a prolonged disruption of gas supply, that appliance will no longer be useful. Free standing wood stoves are the most popular. They can be located centrally in a house or cabin for maximum heating. Many stoves come with an electric blower system, which improves efficiency. However in a power outage, the stove will still produce enough radiant heat to keep you warm. Stoves that have no blower, rely upon their design to produce area heating. EPA Certified solid fuel heaters will have an efficiency rating of 85%, which is nearly as efficient as gas heaters. 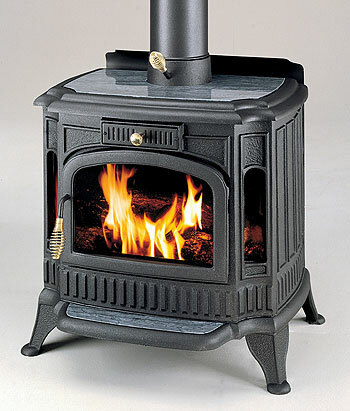 You may be able to pick up an older, used wood stove for not a lot of money. But be aware that the stove may not have the highest efficiency and by law may not be legal in some environmentally sensitive areas. But in a survival situation, the goal is to keep from freezing to death. On a tight budget, an older stove is still a worthwhile investment if it is sound working condition. There is also a class of solid fuel heater called pellet fuel heaters. While they may be the current rage of environmentally friendly solid fuel heaters, they will not function without backup electricity. I used to own a pellet stove. They are nice when you have electricity, but worthless if the power goes off. Unfortunately the cost of transporting the wood pellets is making the fuel source very expensive per BTU of heat. If there is a disruption of the transportation grid, the fuel would become unavailable in many areas of the country. By and large, I would never recommend a pellet heater for a survival heater. Third category of solid fuel heaters is central a furnace. My home was originally "all electric". A couple years ago we had a severe ice storm in Central Missouri that knocked out power to thousands of homes for over a week. My neighbors essentially had to leave their all electric homes because the temperature became unlivable. But I was able to remain in my home. Why? I have a central wood furnace that is ducted into my heating system. Without electricity, the blower circulation will not function. But the radiant heat rose from the top of the furnace duct and circulated naturally through my central ductwork. When it became evident that the power might not be restored for several days, I brought my portable generator into use. I located my generator in my detached garage and ran an electric cord through my clothes dryer vent, into my furnace room. From there I was able to power the wood furnace, freezer, and extra refrigerator. Warning: Because of the risk on carbon monoxide (CO) poisoning, never place a generator in an attached garage or living space! Also be absolutely sure to "lock out" the circuit breakers to prevent a back feed condition to the grid power lines. During the power outage, several people needlessly died due to carbon monoxide poisoning because they placed generators in their attached garage and the CO gas entered the home. The goal is to survive here so be smart. Another popular wood furnace is located outside the house. A generator could run that system from outside. But one disadvantage to an outdoor wood furnace is having to go outside to add fuel. If there is some kind of outdoor environmental situation that makes it unsafe to go outside, the indoor furnace can be fueled from inside wood storage for a few days. Not having to open doors preserves the indoor air quality. The indoor furnace will still send heat into the ductwork without a fan. The outdoor furnace has a much more difficult ducting system that may not transfer enough heat to sustain livability if power is lost completely. Having a generator is very good for short term survival circumstances. But you may be limited on how much use you may get out of a generator if there is a long term disruption of gasoline delivery. You may be able to use a good generator sparingly and operate a wood stove or furnace fan for many days on 5 gallons of gas. But in the long term your solid fuel system should be capable of sustaining enough heat in your home to make it livable under the worst of winter conditions. You may have to consider blocking off some rooms to keep the heat in the main area of habitation. If your wood appliance has a cook top that is capable of basic cooking or boiling water that is a plus. If there is a disruption of water supply, the ability to melt snow or boil water on a cook top wood stove could allow you to process enough drinking water to sustain an ample survival water supply. One last item to consider for a survival situation utilizing any solid fuel appliance is the chimney. I cannot stress enough the importance of having a clean and structurally sound chimney system. If your masonry chimney has cracked tile liners, or is unlined, I strongly suggest you have a Certified Chimney Sweep inspect your chimney and perform any necessary repairs before you consider using a solid fuel appliance. There are stainless steel chimney liners available to reline your chimney. If the chimney has ever been used to vent a gas appliance, the mortar becomes weakened by chemical reactions and is unsafe to use without the addition of a stainless chimney liner. Under no conditions should you vent a solid fuel appliance into a chimney being used by a gas furnace or gas water heater. This can create a dangerous condition. In addition, the gas damages the structure as I've already outlined. The other type of chimney system is called a Class A Chimney. These systems consist of insulated, prefabricated sections of stainless steel pipe that snap or lock together. They can be fully supported by the ceiling rafters, which allow installation in areas where a masonry chimney is impractical. Where a masonry chimney requires a concrete footing, a prefab Class A chimney can be easily installed into any existing structure. A chimney should be cleaned and checked prior to use in the fall, and cleaned and rechecked at least once during the heating season to insure safety and long term durability. All in all, as a matter of long term survival, alternative heat should be a top priority as an equal to food and water storage. Winter may be almost over for many, but now is the time to start gathering firewood for next season. As a rule, one acre of timber produces, by natural turnover, about a cord of wood every year. Not many trees need to be cut to heat your home. I will heat my 1,900 square foot home with two to three cords of firewood a year with very little electric furnace operation. But if you do cut a tree, be sure to plant one for sustainability of your wood supply. In a survival situation. One can never have enough dry, split firewood handy if the power grid goes down in the dead of winter.